Cypher labels were used as a security devise to secure impressed revenues to velum documents by the relevant authorities in the stamping room at the State Treasury. No fee was charged for this service therefore they are not a revenue. They were never sold to the public. 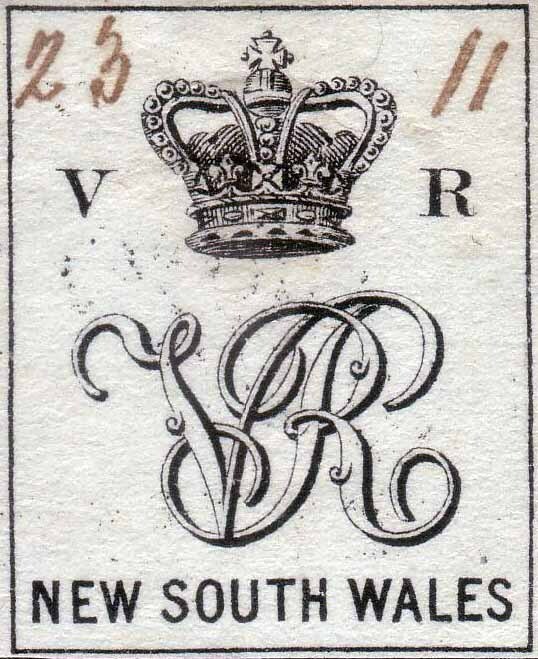 The difference between Queensland and New South Wales Cypher labels as listed below. No printing records have survived for either Qld or NSW. 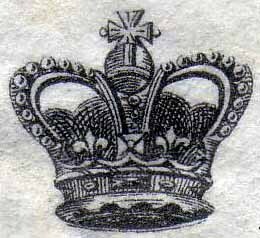 Queensland Crown differs in that the inner fabric of the crown is engraved with a mesh, whereas the NSW fabric has been engraved with single shading lines. 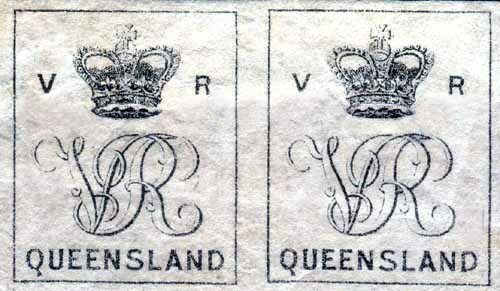 The Queensland Crown is 1mm wider than the NSW Crown. 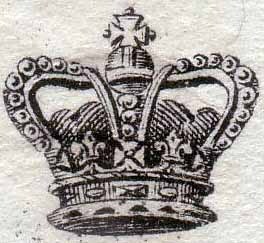 The Queensland Crown has 10 pearls left and right the New South Wales Crown has 9. If you look close you will find further differences in the shading of the cross etc. 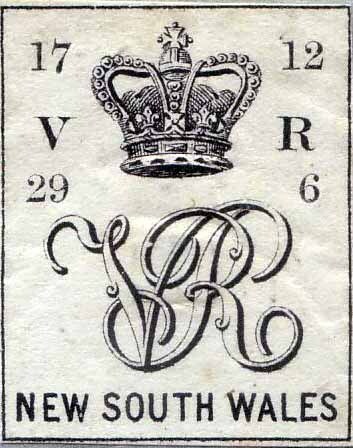 Royal Cypher on the Queensland issue is 11mm x 10mm. The NSW issue is 11mm x 11mm. 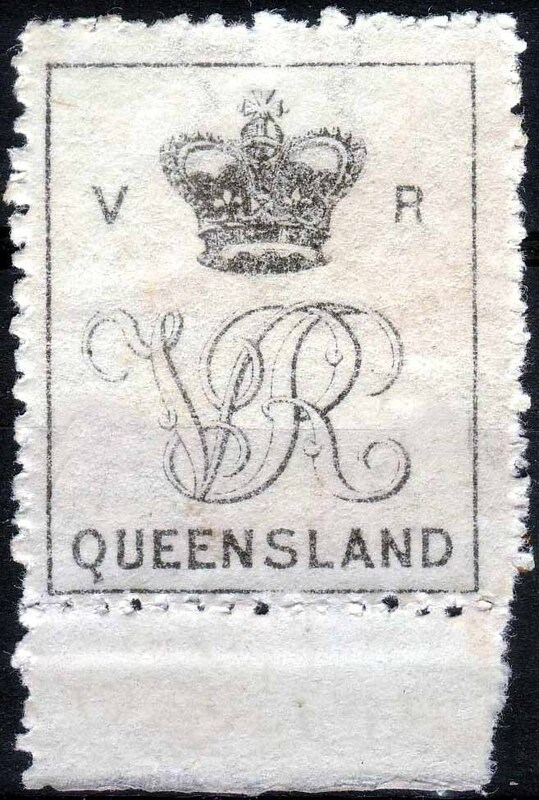 Printed on small truncated star [sg 4] type paper with small star and QUEENSLAND/POSTAGE-POSTAGE/STAMPS-STAMPS in three lines perf 12. I futher have a perforated copy with the corner black 'SPECIMEN' ring on. Used to seal a silver strip [akin to the modern staple] on the reverse of velum, to attach a base paper prior to impressing the instrument. This also applies to NSW. It should be noted all Qld base paper recorded has had the corners cut in a curve whereas NSW base paper was cut with square corners. Both states have recorded light blue base paper issued first both then changed to dark blue. light blue appears very scarce from either state. From a recent discovery I have found a watermarked Queensland type III issue in an imperf pair, this is the first copy on watermarked paper imperf to turn up this also makes it the largest multiple from either state. Maybe proof status, studies continue. 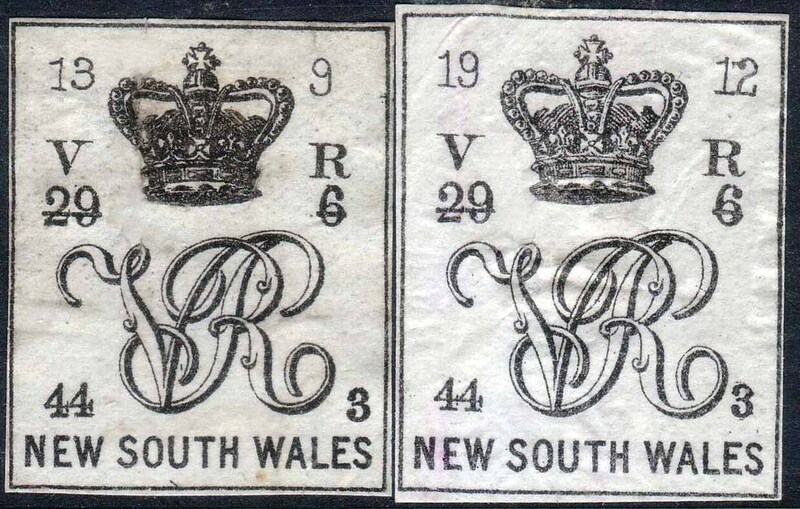 NSW issued 3 different labels Type I, II & III. Type I. c1866 22mm x 27mm. Type II c1874 22mm x 27½mm. With a new Act [Vic.44. No3] in place old stock was used up till the system ceased c1901. 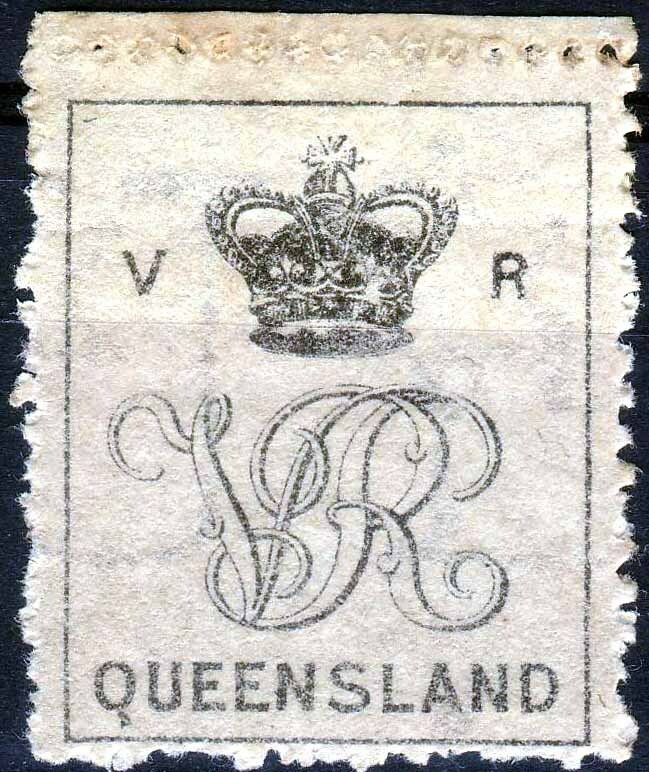 All labels are printed on unwatermarked plain paper except Queensland Type III. This is printed on small star [sg 4] type paper with small truncated star and QUEENSLAND/POSTAGE-POSTAGE/STAMPS-STAMPS in three lines perf 12. 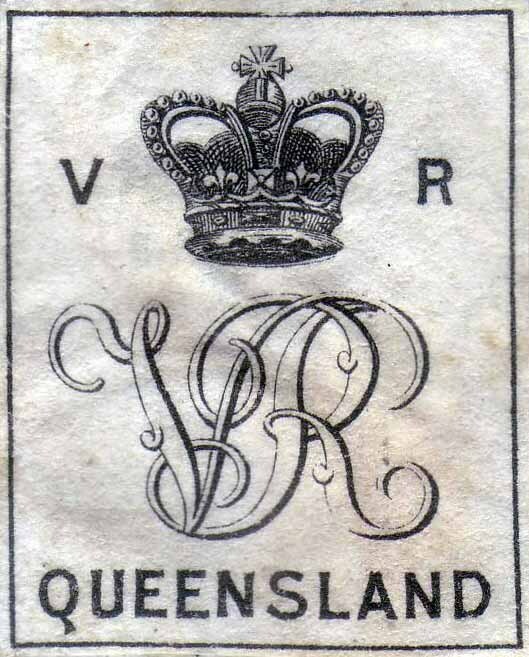 The Queensland watermarked and perforated labels have yet to be found used on a document, it is possible they were prepared and used for Parliamentary presentation packs in 1901 but this does not fit the date of watermark usage all known perforated stamps have gum.